Pongal is the time for farmers to rest after the harvest season and prepare themselves for the tougher days ahead. For them, unavu is marundhu. For instance, elaichi and sukku powder ensures easy digestion on a day when the plate is full of rich food.Sakkarai pongal is an important part of the Pongal festivities. It is a balanced dish as it has all the ingredients that constitute the food pyramid — cereal, pulses, sweet, dairy, nuts and fat.We have different methods to prepare Pongal.This recipe is the traditional method to prepare Pongal. Soak rice and for 15 minutes. Cook rice and fried moong dal with 3 cups of water. Once it is cooked add jaggery, milk and cardamom powder, let it cook for 6-10 minutes. In a separate pan add ghee, once it is hot add cashew nuts and fry until cashew is golden brown colour. Add raisins, once raisin is fluffier mix it with cooked rice and moong dal. 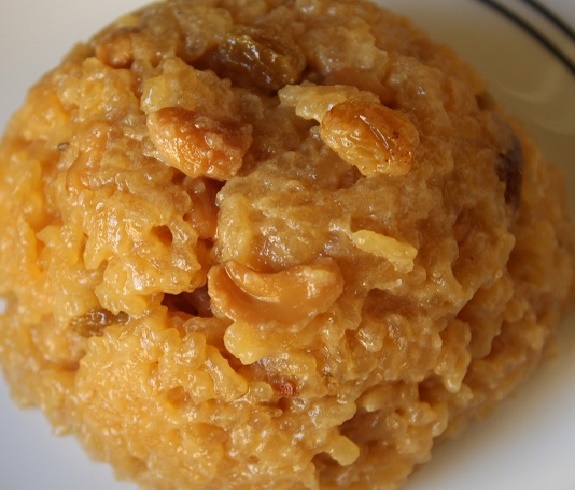 Tasty sweet Paruppu Pongal is ready.